Happy Belated Pi(e) Day! This past Wednesday, March 14th, was one of my favorite math-related holidays. Only because it is also a holiday that involves pie. 3.14, pi, that mathematical constant that only a handful of showoff kids ever knew *all the numbers of, is celebrated on March 14th (3.14) by eating pie. At least that’s how we celebrate it. *clearly not all the numbers, because it goes on forever. I remember something from math. Sort of. This year we decided to use the occasion of Pi(e) Day to celebrate another wonderful cause, the 2012 B’Eat More Pie Fest. For those of you who don’t remember (or who have blocked my incessant discussion of it last year from your mind), I am the co-founder of Baltimore’s own pie festival. Last year the festival was small (we had about 135 attendees), fun, and a huge success. This year we’re in a bigger space and we’re planning a bigger festival with bigger goals. To help us reach the goals and make a sizable donation to the charity the fest benefits, we’re launching today an indiegogo campaign. If you feel so inclined, check it out. Also note that every time that video jumps is because I’m a doofus. 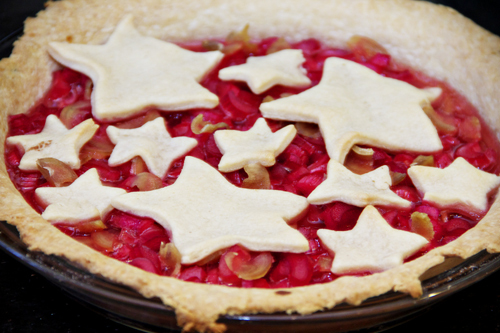 This year for pi(e) day I was able to snag some rhubarb, which I combined with candied ginger for a pie that was light, tart, and the perfect contrast to the months of cream and mousse pies we’ve been eating over here. I even got up at six am on Wednesday morning to candy the ginger, which either exhibits dedication or a need to get my head examined. Start with your dough. Combine dry ingredients. Add shortening and incorporate with your hands. Cube butter and work in with your hands until the consistency is like cornmeal. Stir in water, a little at a time. Only add as much as needed to form a ball. Wrap and chill in the fridge for at least one hour. Thinly slice your ginger. Put in a pot and cover with water. Bring to a boil, then simmer for 10 minutes. Drain and repeat. Then add 1 cup sugar and 1 cup water to the pan. Bring to a boil and let boil until the syrup thickens, approximately 15-20 minutes. Let sit in the liquid for at least an hour. 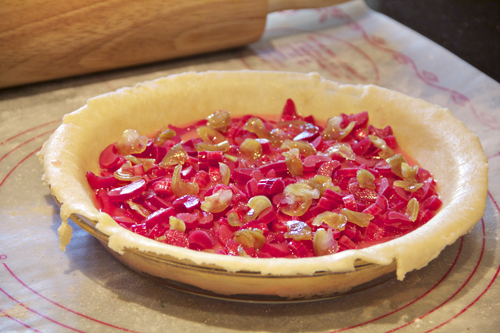 To make the filling thinly slice the rhubarb. Combine with remaining ingredients. 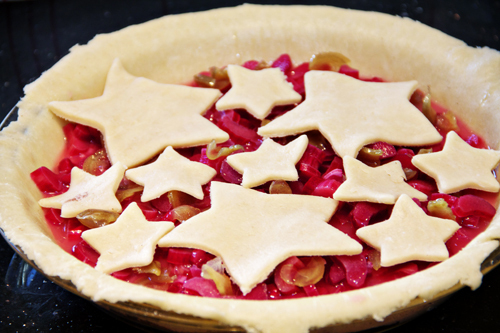 Roll half your dough out and place into pie dish. Pour in filling. Chop up the candied ginger and sprinkle throughout. Preheat your oven to 350. 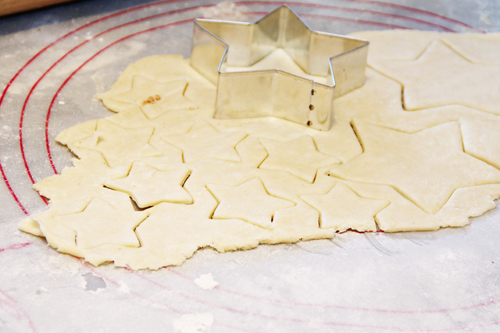 Roll out the other half of the dough and either cut into shapes or roll into one large piece. If you’d like a pie with a top, lay the rolled out dough over the pie and press the two sides together. Cut slits in the top for ventilation. If you’d like shapes cut them out and lay them over the top. B’Eat More Pie Fest from elena rosemond-hoerr on Vimeo.